Here’s our list of truck driver safety pointers perfect for both drivers new to their vehicles and savvy pros looking for a quick refresher. If others aren’t aware of these trouble spots, they may drive dangerously close. As frustrating as this can be, it’s up to you to exercise caution before turning or changing lanes and to maintain a safe distance. Particularly on exit/entrance ramps, the speed limits are meant more for cars; trucks have a tendency to tip over if they take the curves too fast. When going through any curve, it’s best to set your speed far lower than the posted limit to make up for your rig’s unique dimensions. And if you see other truckers pulling over, maybe it’s best you do likewise. If you receive packages in the mail on a regular basis you probably find that you have more styrofoam peanuts, bubble wrap and boxes than you know what to do with. If you ship items out on a regular basis, recycle your shipping supplies by reusing them in your outgoing packages. Put styrofoam peanuts and pieces, bubble wrap and other packing material to use in crafts. Glue materials onto paper for 3-D collages and pictures. Use boxes around the house to organize, sort and store any number of things. Boxes can also be used to hold gifts before wrapping them. Drop your styrofoam peanuts, bubble wrap and other packing materials off at a UPS or pack and ship store. These stores will usually take these products as a donation and re-use them in their business. Run an ad in a free classifieds such as Craig’s List online offering free shipping supplies. Many people do eBay or other online sales and would love to recycle your shipping supplies for you. Place styrofoam peanuts in the bottom of flower pots. This will help with drainage, cut down on the amount of dirt you need to put in the pot, and make the pot lighter weight for moving it. Turn styrofoam into a permanent glue for use around the house. Soak the Styrofoam in a commercially purchased biodegradable solvent. It will break down into a sticky substance that works well as a permanent glue. With forecasters predicting a wet and stormy Christmas getaway, the prospect of driving in heavy rain is rearing its head once again for many in Britain. For many, it’s a daunting task, and no wonder – rain not only reduces visibility, but also the amount of grip your car has, increasing stopping distances. But drive along a motorway in heavy weather, and it’s clear that for others, the opposite is true; many of Britain’s motorists are so over-confident in rain that they barely modify their driving style to suit, if at all. That’s why we’ve put together a guide to driving safely in wet weather. If you find rain scary when you’re on the road, then following these key pointers will help you stay safe. And even if you’re confident in the rain, have a read through, and check you’re driving as safely as you could be. Never forget that floods are inherently dangerous, and before you try driving through one, you should be absolutely certain that it’s safe to do so. 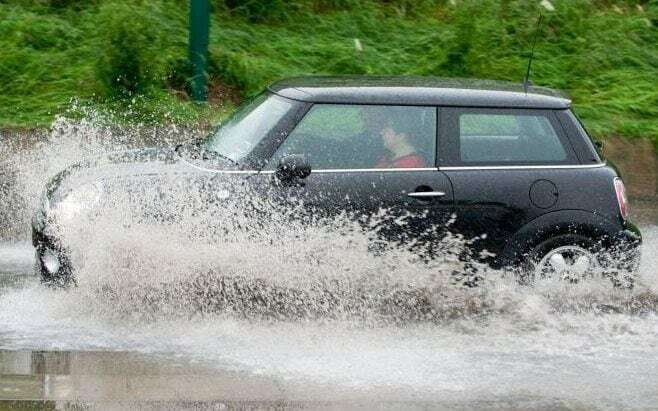 And even if you think the flood is relatively safe, remember that driving through deep water can cause serious damage to your car which might not be covered by your insurance company. Watch other cars driving through to get a feel for how deep the flood is. 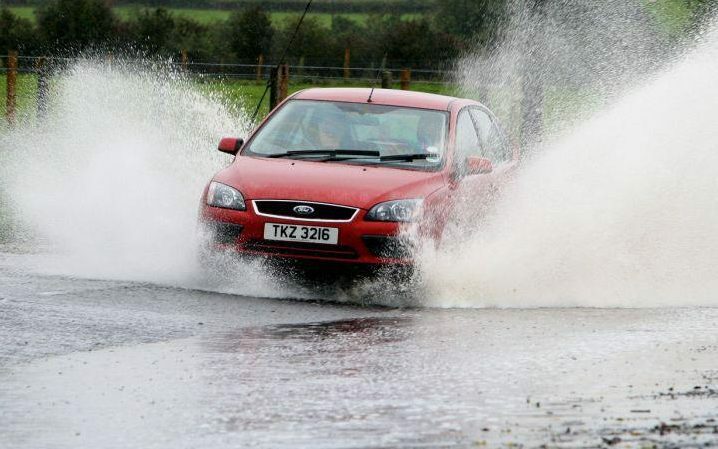 If there are no other cars around, don’t risk it – there may be submerged obstacles, or the water might be fast-flowing, which could sweep your car away. If you’re in any doubt whatsoever, turn around and find another route. If you do opt to drive on, though, make sure your path is clear right the way through to the other side of the flood. Don’t drive into the water when there is still another car driving through the flood. They might stop, which would strand you in the water. Try and keep the car at the highest point on the road, if it’s safe to do so, so that it’s as far out of the water as it can get. Don’t drive too fast, as this might cause you to aquaplane. Instead, find a steady speed you’re comfortable with. Once you’ve accelerated up to that speed, try not to slow down, if you can help it. Any reduction in speed can cause water to flow back into the radiator grille and be ingested into the engine, or even to be sucked up by the exhaust pipe. Either will likely cause expensive damage, potentially even writing the car off. As you reach the other side of the flood, drive out of the water carefully, and test your brakes before continuing your journey. Cast your mind back to your driving test, and you’ll remember that stopping distances increase in the wet. But can you remember by how much? In actual fact, it takes about twice as long to stop on a wet road as it does on a dry one. So you should increase the distance between you and the car you’re following by about that much. You might have heard of the term ‘aquaplaning’, but be uncertain what it means. It refers to what happens when your car’s tyres encounter lots of water that’s standing on the road – more than they can clear. The result is that the water builds up under the tyre, lifting it away from the road surface. Once it loses contact with the Tarmac, you’re effectively ‘surfing’ along on top of the water, with little or no grip. You can usually tell if you’re aquaplaning because your steering will suddenly feel light and unresponsive, and you can hear the displaced water roaring against the inside of the car’s wheel arches. If it happens to you, resist the temptation to brake – doing so will almost certainly cause you to skid, which could have disastrous consequences. Instead, you should stay as calm as you can, take your foot off the accelerator pedal gently, and allow the car to slow down by itself, while keeping the steering pointing in the direction of travel. Eventually, the tyres will bite down through the water and come back into contact with the road, at which point you should regain control. Remember, you mustn’t use your fog lamps unless the visibility is very poor – rear fog lamps will dazzle other road users, and the effect is intensified when there is spray coming out from the rear of the car. Front fog lamps have the same effect, but for cars ahead of you. 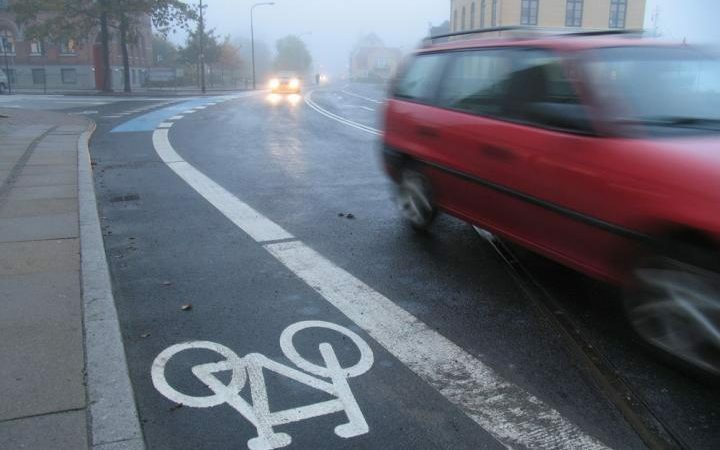 The Highway Code says that you should only use your fog lamps when the visibility drops below 100m. A good rule of thumb is to think about whether you can see the tail lights of the car in front of you. If you can’t, and you know it isn’t that far away, you (and they) should probably be using rear fog lamps. However, if you can, you probably don’t need them. 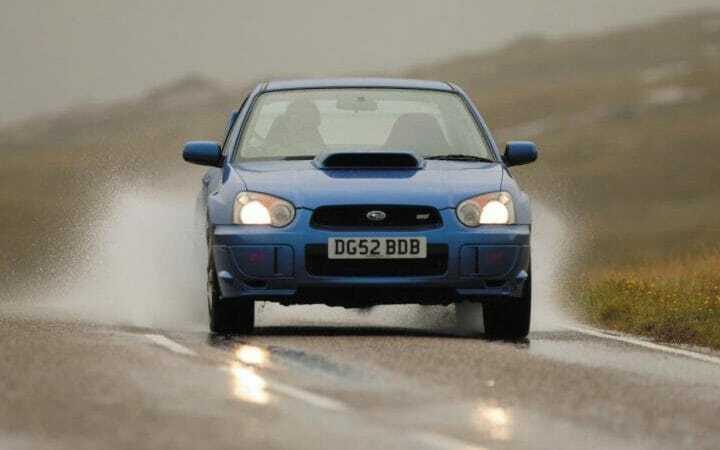 Rain does not mean you need to use your main beam headlamps any more or less often than you would normally. You shouldn’t leave them on when you are driving towards or behind other traffic, as it will dazzle those drivers. If you’re in any doubt about which lights to use, put yourself in the position of other drivers around you. Ask yourself what your car looks like to them, whether they can see you, and whether they might be blinded by any of your lights. If you do decide to venture out, then before you leave, you should try and make a quick check of your lights. Turn on your dipped beams, and check the lights are working on both sides, at the front and at the back. When the rain does start to fall, you should turn your headlights on. Don’t just assume they already are – many cars’ instruments light up even when the headlights are turned off these days, which can be misleading. Rather than relying on the lights on your instrumentation, you should check the position of your headlamp switch and make sure it is set to the dipped beam setting. This will improve your vision, and enable other drivers to see you in good time. If you have automatic headlamps, make sure these have activated – or if you can’t, override them manually by turning the headlamp switch to the dipped beam setting. Courier services have made our society even easier. Regardless of what you need to send where, you can find a courier service to do it for you. Finding such a service is very easy as well. Hiring a courier service means you need to consider quite a few things. The following steps will tell you what you should consider when hiring a courier service. Decide what you need to have shipped. Is it a basic item? An animal? A bio hazardous material? You can find a courier service to ship anything, however, you need to find one that ships your distinctive item. Figure out how much you are willing to spend. Some services will charge you a base rate for the item then a fee per mile. Others will only charge you a per mile rate, such as 40 to 50 cents a mile. Decide which service you are willing to pay for before you begin contacting these couriers. Search the internet, yellow pages or ask a friend for a referral and choose a courier service that fits your needs. If you know of someone who has used a courier service ask them about their experience. Contact the courier service and explain to them what you need delivered. Iron out all the details and ask for a copy of the receipt. Yes, you’ve heard it on the weather forecast all the time, but people say it for a reason. Put simply, if you don’t go out, you can’t come to any harm on the road. Is your journey really that urgent or important? If not, it might be better to stay in, have a cup of tea, and wait until the rain passes. That sounds to us like an infinitely better idea than getting stuck in a queue or, worse, at the side of the road with a crashed or broken-down car as the heavens open.